‘any thoughts on accessing the photo of General Draper from the 30s? Interests:Author of "My Hundred Days of War" (October 16th 2018) and "Malcolm MacPhail's Great War" (2017), two novels of the Great War. Just a thought. Is it actually evidence that the British really were 'disappointed' that the Canadians had Cambrian or that they were 'forced out, so that the British could take the credit - or were there ostrategic/tactical considerations for the decision - for instance Canadian losses - or judged to have done their bit having, as noted in the first post, suffered high casualty figures . I'm feel pretty sure that I have read no plausible accounts which suggest anything other than praise for Canadian efforts, at Cambrai and elsewhere nor indeed any reasons that their efforts were not fully recognised. I actually looked into this. I found only some references from accounts written later that Canadian soldiers had groused that Imperial troops had secured the best winter lodgings by moving into Cambrai (the assumption of the average soldier being, even at that stage, that the war would progress into 1919). Other than that I found only the two war diaries from the Canadian battalions in Cambrai. The 5th CMR (the ones who really actually took the city) reported for October 10th the following terse command: "Orders received that we must evacuate CAMBRAI by 10.00 a.m.", at which point the battalion retired to dug-outs and trenches in the vicinity. The reference from the 4th CMR's war diary is, as is quoted earlier: " Well, we had no business taking CAMBRAI. Someone else, presumably the 3rd Army, wanted the city – volunteered to take it - and were very peeved that the canucks were occupying and defending the place. We are ordered to clear out, which we do, and are all clear of the place by 13.30 and on our way to rest billets". I've included an image of it below to give a flavour of the war diary. Most war diaries I've come across tend to be rather sparse and stilted in their descriptions, which makes that of the 4th CMR quite interesting and, in this case, revealing. Barring total fabrication, the tone in both war diaries suggests somebody was peeved. For obvious reasons I don't think this was Byng. It may have been the XVII Corps commander, or one of the divisional commanders, who were indeed to have taken the city, or perhaps it was nothing more than simple hearsay. Regardless, the perception clearly did exist. To my mind, the thought that someone would be annoyed is not entirely strange. After all, as long as men are involved, emotions always play a role. And this was the first major French city to be liberated. I think, for instance, of US General Clark in WWII who chose to "liberate" Rome, against orders, but thereby allowed German forces to escape - his primary goal. Don't forget as well, during the spring offensives, the Canadians were fairly widely derided as being "Foch's pets". As to the extremely hard-fought 1918 Battle for Cambrai, it continued for a couple days a mile or two north of the city, as Canadian and British troops fought to secure the bridgehead on the eastern side of the Canal de L'Escaut. I hope this may help. It would be interesting to go through the chain of war diaries above battalion level to see what they record of the decision to withdraw the Canadians. I simply do not think it feasible to accept - without question - the statements as given as proof of the assertion without further detailed research. I say this not a a Brit, but because I have come across similar accusation of 'glory hunting' an favouritism before at battalion level about brigade decisions, at brigade level about divisional decisions and on up the tree. Whatever, simply because of the high casualty figures any reasonable commander might well have considered the Canadians had done their bit and it was wiser to replace them. I note again, this is a battalion diary. What light, I wonder, do Canadian brigade and divisional diaries reveal about the decision. I think another 'proof, essential to accept a, relatively low level, assertion, although, as often I could be wrong. Not so sure the description of "The Iron Brigade literally took the city" is strictly 100% accurate, or the statement the 5th CMR were the ones that actually took the city is either. Further research would be needed as David says. 3rd Army were in Cambrai having approached from the south, still sifting through the appendices of which their are a large amount, see attached 3rd army diary. 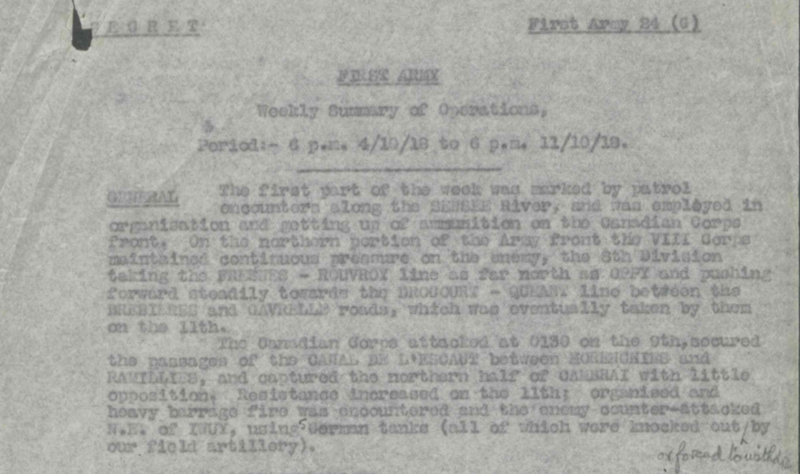 1st Army reports on operations state the Canadians captured the north half of Cambrai, not the entire town. With 3rd Army entering the town from the south. The key word in the 1st Army Diary is "relieved". 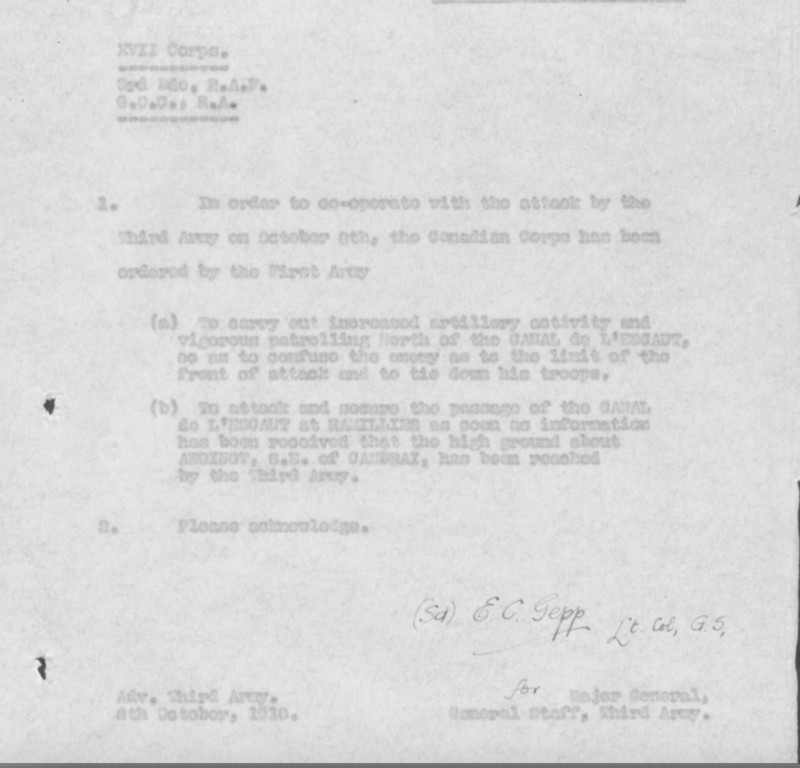 Although this could imply involvement in actions judged a failure, it seems to me more likely to have meant job done, exhausted, or reduced in number, or, simply, a higher command's judged need or planned circulation of units in an action to ensure pressure on the enemy was maintained or increased by 'fresh troops'. That tired troops needed to be brought out of the line. That said one can understand hurt feelings if a formation felt it unnecessary to be pulled out, although published works often indicate nothing but pleasure in being relieved relief from being at the sharp end. It does seem that that they were simply relieved from holding a defensive flank and nothing indicates that it was done to enable British troops to take undeserved credit. I must say I do wonder whether the writer of the 4th CMR war diary came up with a cause-effect relationship that didn't exist. Which is to say somebody might have been "peeved", but that wasn't necessarily the reason for the orders to pull out. In fact, thinking about it, it would seem sort of pointless, anyhow. What happened, happened, and switching troops around a day later wouldn't change anything. As David says, I think the relief is indeed precisely that: both battalions and the entire 3rd Division did move (on the 11th) to Queant for two weeks. What I find interesting is how and why this idea that someone in 3rd Army was peeved came about in the first place. Did someone say something? And who would that be and to whom and when? Or was it is just hearsay, etc., etc. Unless someone's described this in memoirs somewhere, we may never know. Maybe the 3rd Army were a little peeved because Cambrai was a tad out of the Corps Boundary, except for the very north suburbs and would probably been regarded as a prize. Who knows?? however the information given regarding taking the city is inaccurate, as you can see from 1st Army reports on operations they captured the north of Cambria only. You've gone to a great deal of work and what you've unearthed is extremely interesting. 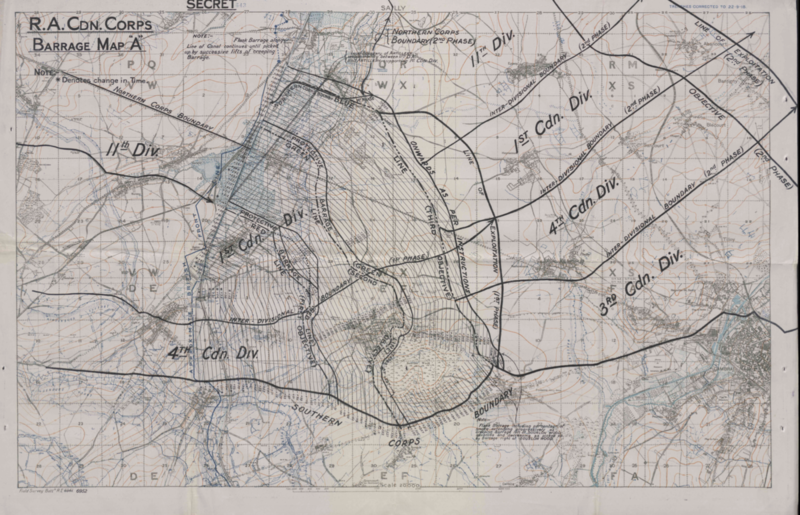 I might just point out however the barrage map was the original plan, which obviously underwent some changes! I thought you might be interested in the following: the Brigade WD for the day in which the actual positions are noted. I added a map to make sense of it all. The Brigade reported being in map squares A 10,11,12,16,17,18. This appears to be what is meant by the north of the city. Thanks, presumably so. There is no doubt that the Canadians were in Cambrai as noted by 1st Army operation reports and the Brigade Diary. I am still not convinced re. the lower echelon diaries through consulting other little snippets in the Army Diaries and have to agree with David regarding them and some element of glory hunting, not unusual. Seen up to Corps level in many instances, also apportioning blame, objective would have been reached if the blankety division had kept to it's objectives etc. There is just such a volume of orders, reports, build ups etc to wade through, 11 files of 260 odd pages a file for October 1918, just in the one diary, then comparing it to the other Army. The barrage map is in the file for ops on the 8th, but as you say matters change.